We’re less than two weeks out from InfoComm 2018 Las Vegas, and the Logitech team is gearing up for one of our best shows yet. Last year at InfoComm, we introduced Logitech MeetUp, and we’re pleased to say people love it! But we’re never going to rest on our laurels so you can expect more exciting news out of Logitech at this year’s show. To get a preview, check out this video from the Microsoft keynote at Enterprise Connect 2018. But that’s not all – it’s just all we can tell you right now. Stay tuned to see what else we’re announcing. But wait! There’s more! Personally, I’m most excited about our awesome social media contest. If you like today’s most popular online trivia game HQ, you’ll love #LogiTrivia – and just about anyone who plays is a winner – not only because you’ll automatically receive a discount code for Logitech products, but also (and more importantly) you’ll be raising money for the Boys & Girls Clubs of America! 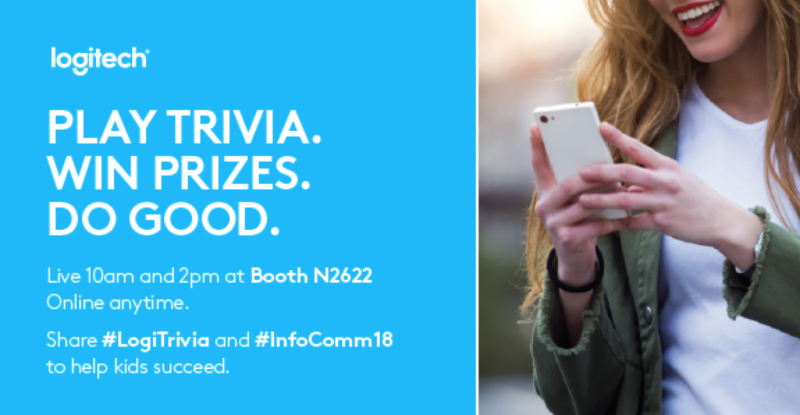 For every #LogiTrivia #InfoComm18 mention on Twitter, we’ll be donating $1 (up to $10K) to the organization. We’ll be giving away great prizes to players at the show and online so if you’re not in Vegas, don’t despair. You can still win prizes daily including our Grand Prize Logitech & Sonos Smart Home package. Click here for full details on our #LogiTrivia program. We’ll also be active participants at this year’s IMCCA sessions. Below are the panels we’ll be joining, and we hope to see you there. You can register online here. If you’re coming to Vegas for InfoComm 2018 this year, be sure to visit the Logitech Booth (N2622) to see our latest and greatest video collaboration and home AV solutions. We also hope you’ll play #LogiTrivia either in the booth, where we’ll be giving away prizes to a few randomly selected winners each day, or play online June 6 – 8 at playlogitrivia.com. We’ll also be streaming the booth games on Facebook and Twitter.